Special Containment Procedures: SCP-1376 is stored in a standard secure locker at Site 19. Experimentation with SCP-1376 may only be performed with prior permission from at least one (1) Level 3 Senior Researcher, and all recordings created using SCP-1376 must be thoroughly inspected for classified information. All recordings created using SCP-1376 are available for research via Site 19's secure database. 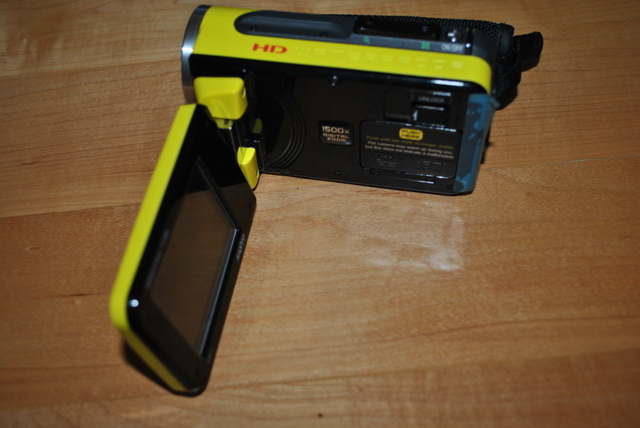 Description: SCP-1376 is a yellow Sanyo VPC-WH1YL waterproof camcorder manufactured circa 2009, and is outwardly unremarkable except for some minor scuffs and scratches as a result of extended use. Whenever a video recording is created using SCP-1376, the resulting audio track is narrated by a male voice with a British accent in the manner of a nature documentary through unknown means. The audio modification is consistent with professional-grade post-processing and audio mixing and even includes fading in and out of the original audio as appropriate to the subject matter recorded. Still images created using SCP-1376 are unaffected. SCP-1376 came to the attention of the Foundation on ██/██/09 as a result of a notification from automated systems monitoring instant-messaging communication in which [REDACTED], the original owner and purchaser of SCP-1376, attempted to explain its anomalous properties to an acquaintance. [REDACTED] was detained and questioned by a Foundation response team, who claimed to have purchased SCP-1376 off the shelf in a local store. Subject was released after being administered a Class A amnestic and given a replacement unit of identical make. Disassembly and inspection of the components of SCP-1376 has yielded no irregularities or abnormal components. All units of identical make from the same production batch of SCP-1376 have been tracked down and inspected, and none have exhibited the same anomalous properties. Subject: A recording created by SCP-1376's original owner of his wife, presumably as a test of its capability after initial purchase. Subject is in the living room of their home and conversing with [REDACTED]. Dialogue is faded out and unable to be deciphered. Narration: And here, we see his mate in the heart of their den. Extremely protective, the female will go to extreme lengths to protect her offspring, even resorting to violence if necessary. Although the pair are quite close and affectionate, she will later spurn his advances, citing exhaustion with her daily rounds. Subject: A static recording of a tennis ball placed on a table. Narration: As noon approaches, it grows increasingly confused, as the creatures around it show no sign of using it for its intended purpose. Struggling to attract their attention, it becomes ever more distressed as it finds itself completely immobile. Subject: A Rhesus monkey kept in a cage at Site 19's animal testing laboratory. Subject walks around its cage listlessly before sitting down and eating fruit. Researcher Note: All subsequent recordings created using SCP-1376 are to be screened for possible classified content, and sensitive data redacted as necessary. Subject: An incidental recording of Dr. ██████ made by Dr. ████████ during unrelated experimentation. Narration: Despite the male's calm facade, his lust for his female companion is extraordinary. The degree to which his obsession reaches has become nearly unhealthy, dominating his thoughts at every turn. Wild fantasies course through his mind when he watches her when she doesn't notice. Researcher Note: Dr. ██████ was treated for a broken nose after being attacked by Dr. ████████ and both researchers have been placed on administrative leave for a period of no less than two (2) weeks pending disciplinary action and transfer to another site.